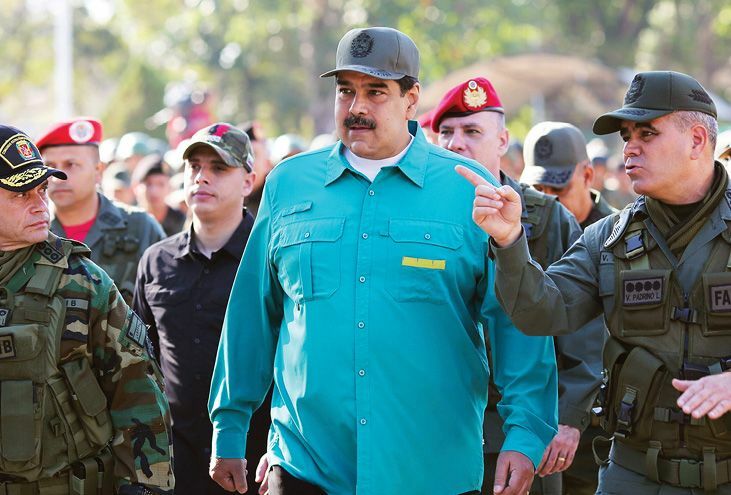 An embattled Maduro turns to his military. Pressured by massive street protests, a charismatic political antagonist, and a cutoff of U.S. oil revenue, embattled Venezuelan President Nicolás Maduro reluctantly offered this week to negotiate with the opposition. Maduro’s overture signaled his growing fear of losing a six-year grip on power after a convulsive week in the South American nation. The previous week, National Assembly head Juan Guaidó, 35, boldly declared himself the legitimate president amid tens of thousands of supporters—days after Maduro was sworn in for a second six-year term following an election in which opponents were barred from running. The U.S. immediately recognized Guaidó, the first of several nations to do so, including Brazil and Canada. China and Russia, among others, are supporting Maduro, who is now reportedly protected by Kremlin-backed mercenaries. The Trump administration sanctioned the state-owned oil company, Petróleos de Venezuela, S.A., freezing $7 billion in U.S.-based assets. Venezuela had been selling 500,000 daily barrels of oil to U.S. refineries, and the loss of billions in revenue will be crippling to the Maduro regime. Venezuela’s socialist government has presided over a major economic crisis marked by severe food and medicine shortages, hyperinflation, and an exodus of 3 million refugees. As the Maduro government continued a crackdown that has left 35 dead and seen 850-plus arrested, national security adviser John Bolton warned Maduro against any violence toward Guaidó and the opposition. “The president has made it clear on this matter that all options are on the table,” Bolton said. He was seen holding a pad on which “5,000 troops to Colombia” had been written—a reference that the White House confirmed concerned Venezuela. President Trump acted decisively with his “quick recognition” of Guaidó, said the Miami Herald—an “important step,” to be sure, in “increasing international pressure on Maduro.” The U.S. and other democracies have sent a powerful message that “Venezuelans are not alone.” Maduro, whose regime has persecuted, imprisoned, and tortured opponents, must go. But it’s Venezuelans themselves who must remove him. As socialist ideas become mainstream in the U.S., “the lesson of Venezuela is one that American voters should take to heart,” said the Washington Examiner. Socialism, of every variety, is a corrosive force ruinous to every country in which it’s taken root. Don’t forget this when you see U.S. politicians embrace this failed system.